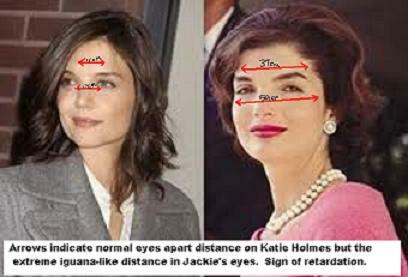 Katie Holmes – makeup to look like Jackie Kennedy. Home → Damien Zone → Katie Holmes – makeup to look like Jackie Kennedy. “We tried to get her eyes as far apart as we could,” said Phillipe Rogetterie, Katie Holmes’ makeup man for the upcoming mini-series on Reelz Channel ‘The Kennedy’s’. Making Katie’s eyes look like Jackie’s eyes took up three quarters of the films budget and producers were starting to think that maybe they should have changed the script a little and made it where John Kennedy had married a completely different woman so they could just ditch the Jackie angle altogether. The History Channel said that they ditched airing this mini-series because there were historical innaccuarcies — baloney ! How inaccurate can they be if they spent millions getting the eye distance apart right? They didn’t want to air it because The History Channel wanted to put 5 minute commercials every 6 minutes — a move that would have killed the movie. The History Channel has the most minutes of commercials per show by far — far more than any other channel. They recently aired a 7 minute block of commercials during a UFO show and viewers jammed the switchboard with complaints. The only one who looks, acts and SOUNDS retarded…is you. I love the Jackie lovers — they’re so dopey. I love the Jackie bashers even more… they’re 100x dopier. for a bunch of people who claim she’s so ugly/retarded-looking, I’ve never seen such hardons for that woman as they have! The only sign of retardation that is evident on this page is none other than the person who wrote that nonsensical infused piece of crap above! You live in the world’s biggest shithole — the toilet bowl of the earth — what would you know, Sam M. Go throw a spear at somebody or something. I have noticed when Jackie is looking down with no bangs, she looks like she has downs. I think at times she is beautiful and radiant but yes at times she looks SPECIAL. You, Beth, are very observant.